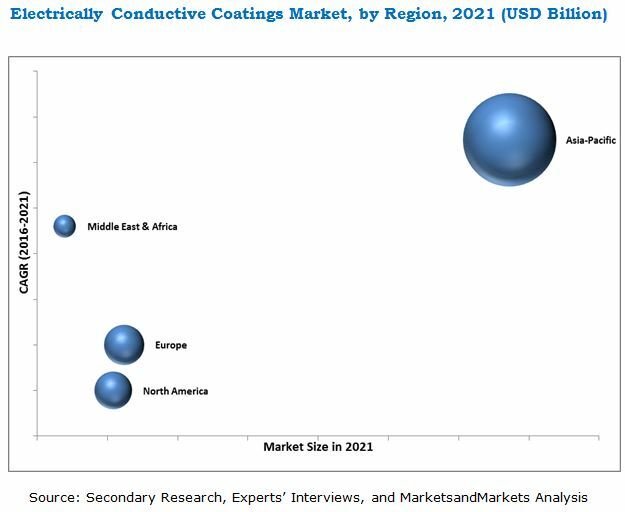 [112 Pages Report] The global electrically conductive coating market is projected to be valued at USD 18.88 Billion by 2021, at a CAGR of 8.0% from 2016 to 2021. In this study, 2015 has been considered the base year, and 2016 to 2021, the forecast period, to estimate the global electrically conductive coatings market. The growing demand in the Asia-Pacific, European and North American regions, coupled with the growing consumer electronics sector, is expected to drive the global electrically conductive coatings market during the forecast period. This research study used extensive secondary sources, directories, and databases, such as Hoovers, Bloomberg BusinessWeek, and Factiva to identify and collect information useful for this technical, market-oriented, and commercial study of the global electrically conductive coatings market. The primary sources are mainly industry experts from core and related industries and preferred suppliers, manufacturers, distributors, service providers, and organizations related to all segments of the industry’s supply chain. The bottom-up approach has been used to estimate the market size of electrically conductive coatings on the basis of type, application, and region, in terms of value and volume. The top-down approach has been implemented to validate the market size, in terms of value and volume. With the data triangulation procedure, and validation of data through primary interviews, the exact values of the overall parent market size and individual market sizes have been determined and confirmed in this study. Raw material suppliers to electrically conductive coating manufacturers are mainly categorized into two groups, namely, binder companies and companies supplying filler materials used in the formulation of electrically conductive coatings. Some of the major companies supplying electrically conductive coatings are, The PPG Industries Inc. (U.S.), Henkel AG & Company (Germany), Akzo Nobel N.V. (Netherlands), Axalta Coating Systems (Netherlands), Creative Materials Inc. (U.S). 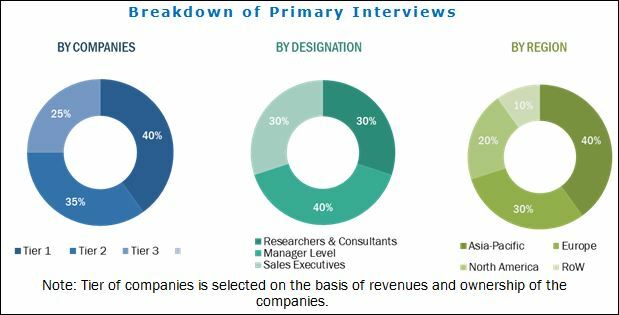 This research report categorizes the market for electrically conductive coatings based on type, application, and region and forecasts revenue growth and analysis of trends in each of the submarkets. These segments are further described in detail with their subsegments, in the report, with value and volume forecasts till 2021. The global electrically conductive coating market, in terms of value, is projected to reach USD 18.88 Billion by 2021, at a CAGR of 8.0% from 2016 to 2021. In terms of volume, the market is projected to reach 17.6 KT by 2021, at a CAGR of 7.0% during the forecast period. The high demand for electrically conductive coatings for consumer electronics displays in the emerging economies of the Asia-Pacific region and Europe and North America, and the mergers & acquisitions and new product development strategies by different companies, are the key factors driving the global electrically conductive coatings market. Acrylics is projected to be the fastest-growing segment of the electrically conductive coatings market, in terms of material type. Acrylics is gaining importance in the global electrically conductive coatings market due to better conductivity, low cost, good moisture resistance and excellent weatherability. It has considerable potential in coatings for the consumer electronics and automotive industries application. Consumer electronic displays is the largest application of electrically conductive coating globally. Electrically conductive coatings are used in LCDs/electronic displays/touch panels, computers/cell phones/radios/calculators/pagers, as thin layers over plastic cases and plastic housings in these products to provide EMI shielding and dissipation of static charge. These coatings are also used in electrolysis processes as thin layers of coating for tantalum capacitors and ceramic surfaces. The Asia-Pacific region is the highest growing in the global electrically conductive coatings market and is expected to continue so till 2021. China leads the Asia-Pacific region electrically conductive coating market due to its huge population and growing economy. China, along with India are projected to be the fastest-growing markets in the global electrically conductive coatings market. Rapid development in the electrically conductive coatings market in major economies, namely, China, Japan and South Korea are driving the demand for electrically conductive coatings across the world. Also, with the growing demand and the production of various electronic equipment and rising disposable incomes, China is expected to remain the main hub for the consumption of electrically conductive coatings during the forecast period. Though the global electrically conductive coatings market is growing at a fast pace, a few factors are hampering its growth. The enforcement of stringent environmental regulations to limit the emissions of volatile organic compounds (VOCs) and hazardous air pollutants (HAPs) is impacting the global electrically conductive coatings market. Companies such as PPG INDUSTRIES INC. (U.S.), HENKEL AG & Company (Germany), Akzo Nobel N.V. (Netherlands) and The Axalta Coating Systems (U.S.), are the leading market players in the global electrically conductive coating market. These companies have been adopting various organic and inorganic growth strategies such as expansions, mergers & acquisitions, and new product launches to strengthen their shares in the global electrically conductive coatings market.